When the secret government organization MI13 sends Professor Dunning and Inspector Lionheart to investigate the mysterious death of a minister in Whitehall, they are soon led to the Denge Marsh of Kent, England. More strange things are afoot there, which leads to their confrontation with a cult that worships none other than Shub-Niggurath! Will they be able to thwart the cult’s plans to summon the eldritch being in time? And how do the marsh’s abandoned acoustic mirrors tie into all of this? One wouldn’t normally assume that a story that starts with a death by melting would be comedic in tone, but that’s precisely how this (and all adventures of the Scarifyers) plays out. 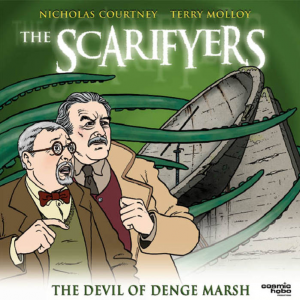 Bafflegab Productions (formerly Cosmic Hobo Productions) has masterfully combined humor and horror in The Scarifyers: The Devil of Denge Marsh. The worshippers of Shub-Niggurath especially stick out in my mind, as they are both creepy and hilariously bizarre and this characterization never feels unbalanced or out-of-place. I also appreciated the use of real-life locations. Don’t get me wrong, I love Lovecraft’s fictional locales, like Arkham and Dunwich, but adding some reality to the mysterious events is a welcome change of pace. Setting the story in the late 30’s also helps add to the overall feel. Lionheart and Dunning are portrayed by Nicholas Courtney and Terry Molloy, best known for their portrayals of Brigadier Lethbridge-Stewart and Davros respectively on Doctor Who. In fact, longtime readers of the site will surely remember Courtney’s performance as the Brigadier in UNIT: The Coup. Both performers, along with everyone else in the cast, give excellent performances. Although it’s the duo’s second outing together, the story can be enjoyed without having any knowledge of the previous installment. Considering how the story is a 3 part, 96 minute long serial running over the course of 2 CDs, this is a big point in its favor. In addition to the other installments in the series, the popularity of The Scarifyers has also led to a comic book and soundtrack CDs! The series has also aired on BBC Radio 4 Extra. 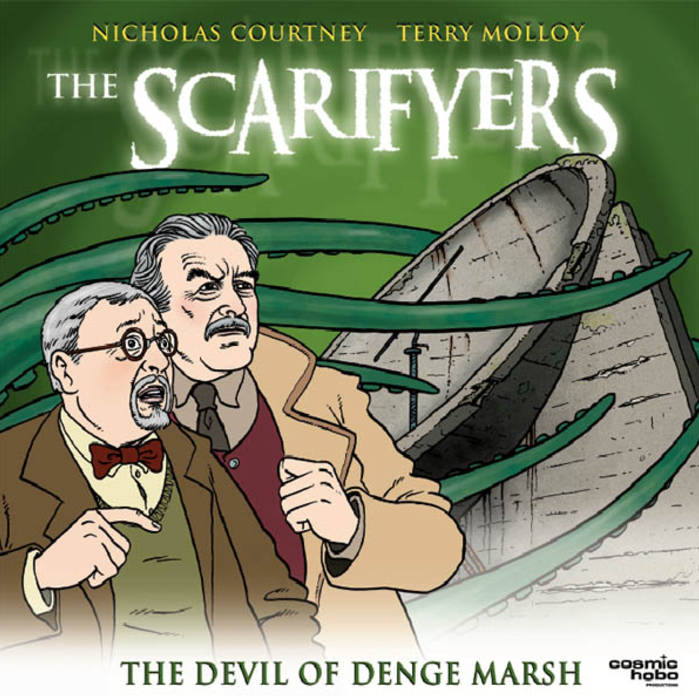 Sadly, Nicholas Courtney passed away in 2011 (his last appearance being 2010’s The Scarifyers: The Secret Weapon of Doom) and his character was written out of the series in the story The Scarifyers: The Magic Circle, which introduced his replacement Harry “Thumper” Crow (played by David Warner). In fact, the latest adventure featuring Crow and Dunning is the upcoming The Scarifyers: The Thirteen Hallows, which is scheduled for a December 3rd, 2012 release. If it’s anything like the subject of today’s review, then it’s a definite must-have.